The most beautiful city in all of Thailand is Chiang Mai. People flock to her from the world over, charmed by her history, customs, and culture. She fascinates all who enter her gates. She enchants with her mountain landscapes. Chiang Mai is always celebrating. Through weekly street markets and seasonal festivals, she wears a radiant smile. She welcomes with warm hospitality. Within her moat walls, built by former kings, temples bless and protect her. She is a sparkling jewel, home to magnificent landmarks that delight the eye and stir the heart. Tha Phae Gate is the east entrance to the old city district. It is part of the wall that surrounded the city at its founding. Unlike earlier Thai settlements that were oval, Chiang Mai’s architectural plan called for a rectangular moat and wall. Their purpose was to protect the city from Burmese invasion. They also symbolised the seas and mountains of Thailand. The eight main gates of the old city face a specific direction according to the eight compass points. Each has its own astrological significance. Tha Phae Gate faces east and signifies prosperity. 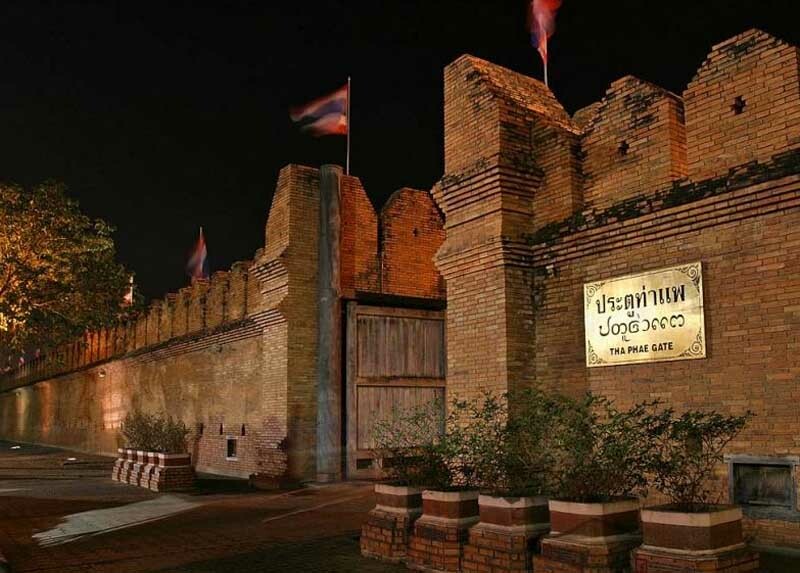 Historically, it was the main gate through which monks, traders, and diplomats went to enter Chiang Mai. Much of the original city wall fell to ruin, but Tha Phae Gate remains. Today, it is the site of many cultural activities and festival celebrations. 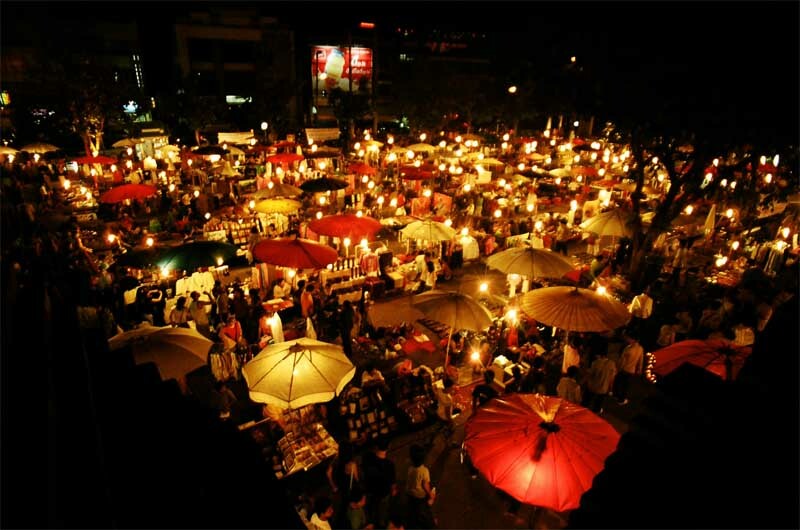 Among them are the Chiang Mai Flower Festival in February, the Thai New Year of Songkran in April, and the Loy Krathong Festival in November. Tha Phae Gate is the site of the magnificent Chiang Mai Flower Festival. The gate is transformed into a centre of agricultural displays, floral exhibits, contests, and sales. A parade features 25 flower-trimmed floats and dancers in traditional garb. Floats compete for the most creative and beautiful display, and the winner is awarded a trophy from the Royal Princess. There are two beauty contests and the selection of Miss Flower and Miss International Flower. Over 200 varieties of flowers and plants are showcased. Musical entertainment is also provided. 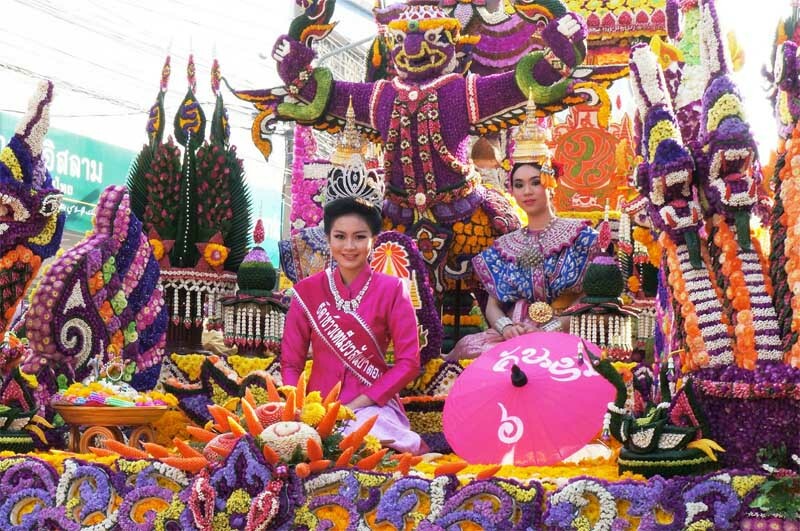 Held every year on the first weekend of February, the Chiang Mai Flower Festival is a thrilling event. The Sunday Market offers the opportunity to shop and bargain with local vendors. It features high-quality Thai crafts of silk, fabric, metal, wood, ceramic, and glass. These make beautiful gifts and home decor. Also for sale are clothing, shoes, jewellery, and souvenirs. After dark, the Sunday Market becomes especially lively, when street entertainers take center stage. Musicians, bands, puppeteers, and dancers delight the crowds. Coloured lights further amp up the festive atmosphere. The area also features a number of cafés and restaurants. This weekly market event hosts the city’s silversmiths and jewellers. You can also browse bags, belts, candles, clothing, perfume, housewares, and ornaments. Handcrafts are a highlight, including wood carvings and aluminium sculptures. Street performers entertain, and food stalls feed the crowds. At dusk, the market glows with lights and lanterns. With vendor umbrellas in vivid colours, the market resembles a rainbow. The Night Bazaar occurs every evening. Goods at the cheapest price are its allure. Arcades and stalls line the road, featuring antiques, clothing, watches, sunglasses, shoes, handbags, handcrafts, and home decor. Vendors are prepared to bargain, and 20-30% off an asking price is possible. To make your purchases easier, use Thai Baht as currency. If you are short of cash, there are many banks and ATMs in the area. Money Exchanges can also be found near 7 Eleven and McDonald’s. Maintaining a sheltering stance over her beloved city is the temple of Wat Phra That. Crowning the crest of Mount Suthep, she is capped by a golden spire. Visitors can climb the 309 red brick steps or take a tram to the top. A rear terrace offers panoramic views of Chiang Mai. The temple architecture has both Buddhist and Hindu themes. This is evident in the statues of the Emerald Buddha and the elephant Hindu God, Ganesh. Within the temple compound are museums, shrines, and pagodas. Bells and gongs surround the halls, which can be rung by visitors. At the base of the serpent-lined staircase, vendors sell souvenirs and handcrafted items. As this is a working Buddhist monastery, you will see orange-robed monks engaged in worship. Obtain good fortune by walking clockwise around the central pagoda three times. You can also request a blessing from one of the friendly monks. Visitors must dress appropriately, with clothing that covers the arms and legs. Hours – 8:30am-4:30pm Daily, except December through March. Tickets can only be purchased from 8:30am-11am and 1pm-3:30pm. Approximately 6 km from Wat Phra That is the Royal Winter Palace. 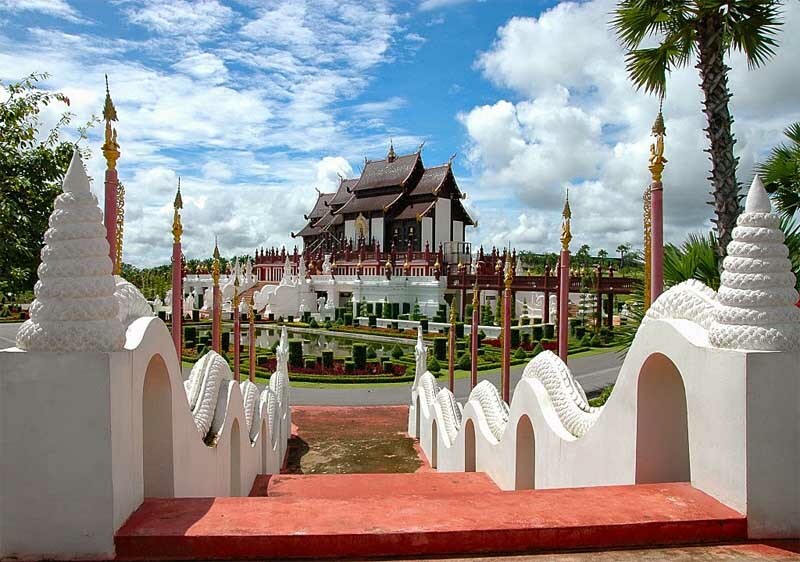 Also known as Phuping and Bhubing Palace, it is the winter residence of the Thai Royal Family. The palace complex consists of the Main Residence, the Royal Guesthouse, three Royal Log Cabins, and the Royal Shrine. The palace buildings are not open to the public, but their splendour can be enjoyed from outside. The royal gardens are spectacular! Each season features a succession of blooming flowers and plants. On display are orchids, roses, camellias, ferns, and bamboo. A fountain on a reservoir sings sweetly and provides water to the palace. The expansive grounds can be covered by foot on well-designed paths. A trolley can also be rented. The palace dress code calls for clothes covering the arms and legs. The hill tribes are a minority people who live in the remote areas of Thailand. There are nine tribes inhabiting the mountains and valleys. Each tribe has its own religion, language, and customs. With the gradual pull of tribal people into mainstream life, their traditions are at risk of extinction. The Tribal Museum was designed to preserve these cultures. The collection includes crafts, instruments, farming tools, jewellery, and colourful costumes. The fine handiwork of tribal women is displayed in beautiful embroidery, needlework, and weaving. Many of these items are available for purchase at a monthly tribal market. A slide and video presentation describes modern tribal life. Beautifully landscaped grounds exhibit tribal huts in a lakeside setting. The main building bears stunning architecture with its octagonal design that spans three floors. 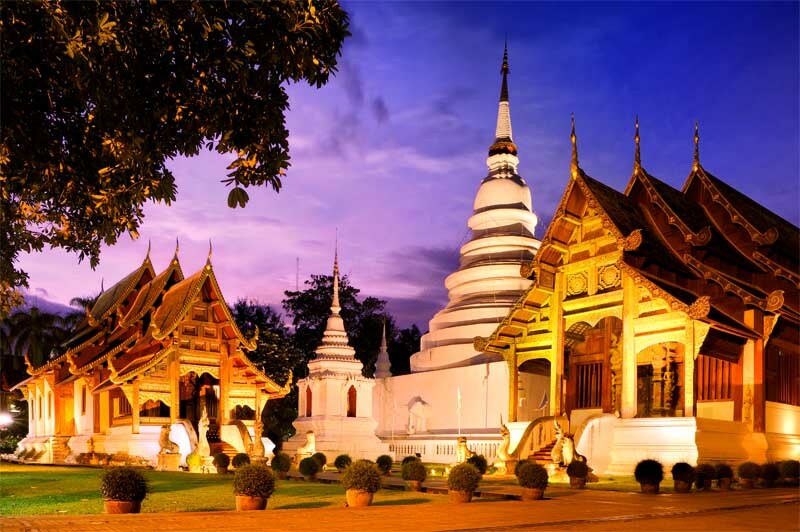 This is Chiang Mai’s most renowned temple. Of greatest historical interest is the shrine hall in the back. It houses a revered Buddha statue, the Phra Buddha Singh or Lion Buddha. Each year during Songkran, the statue is taken from its shrine and carried through the streets of Chiang Mai. Spectators honour the image by sprinkling it with water. The shrine also features an altar mural with exquisite gold and red stencilling. Other walls in the chapel have murals depicting 19th century life in Chiang Mai. The ordination hall contains a smaller version of the Lion Buddha and a replica of the Emerald Buddha. The temple library is one of the most ornate in Thailand. It is guarded by golden serpents flanking the stairs. The library roof is clad in gold lacquer and glass mosaic. A three-tiered pagoda is a monument containing ancient relics. 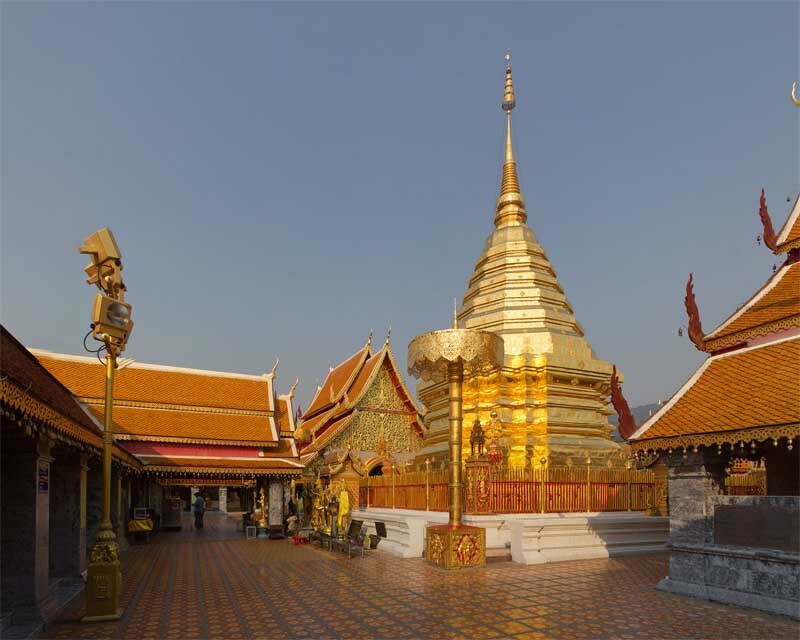 Wat Phra Singh is home to hundreds of monks and novices. Visitors should wear clothing covering the arms and legs. Our hotel is Chiang Mai’s newest landmark. We are the golden key that opens the door to her treasures. Stunning design is our signature style. Impeccable service is our promise. Come and explore the Rose of the North from our city sanctuary. Relaxation, pleasure, and comfort are yours at akyra Manor Chiang Mai.